It’s a busy time in high fashion, from Couture Fashion Week in Paris and Fall 2016 Fashion Week in New York, to the upcoming Oscars. While all of these events provide opulence and elegance, the annual Grammy Awards, the biggest night in music, give musicians, models and actresses the opportunity to let loose and experiment with more fun silhouettes and bolder colors, and to don exciting accessories to match. Below are the biggest trends we noticed on the red carpet, along with Ariva’s guide to recreating the looks in silver. The standout jewelry accessory of the night was the statement ring. Artist after artist chose to stack them up or wear one on every finger, like nominee Elle King and singer Zendaya. Color was in! 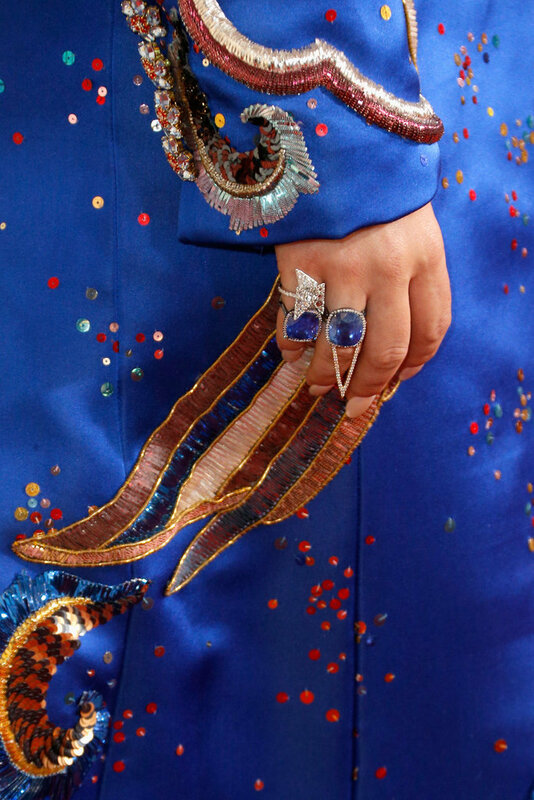 Necks and fingers were popping with bold gemstone colors, like Album of the Year winner Taylor Swift’s natural sapphire pinky ring and multi-colored gemstone choker, and performer Lady Gaga's blue sapphire rings. All silhouettes were represented, from presenter Selena Gomez in hoops, to models Bella Hadid and Chrissy Teigen in studs. Looks ranged from edgy, like model Alessandra Ambrosio in chain chandeliers, to classic, like actress Anna Kendrick in diamond drop earrings.